Reserve com antecedência para que você não tem que ficar em um hotel CRAPPY! O apartamento no térreo é um dois quartos / uma unidade de banho. Este apartamento acomodará até 7 pessoas. Uma cozinha com tudo que você precisa para refeições básicas é fornecida para você. Você também pode desfrutar do balanço da varanda e mesa e cadeiras Pátio no pátio da frente espaçoso. O apartamento no andar de cima é um quarto / um banho com uma cama king size e 2 futons confortáveis ​​na sala de estar, que vão dormir mais 4 pessoas, e um rolo em volta de berço, para dormir 7 total no andar de cima, cozinha completa com tudo que você vai precisar de refeições básicas. Uma mesa com capacidade para quatro e bar para 2 pessoas. Grande frente e decks de volta com mesas ao ar livre para 8 e grelhador a carvão. Wonderful location and lots of fun for kiddos who love trains. This was a great find for us because of the size of our family. Because of the cold weather I would say that one nice feature would have been if there was an Indoor staircase connecting the two apartments. However that is a structural issue and not something that is a deal breaker. Now I will say if you are a large group and plan on doing big cooking, you may want to bring some of your own pots and serving bowls. Overall this is a nice place with comfortable beds and open layout. We had a great time visiting Santa Claus and seeing all the holiday lights. I would definitely recommend this home! Perfect place for our Girl Scout Troop! Our Girl Scout Troop rented both apartments for one night after a long 9 hour day at Holiday World. There was plenty of kitchen space for our group to make dinner and relax. The beds were super comfortable and there were plenty of towels and extra linens for our girls. The sheets on my bed were so soft I didn’t want to get up the next morning! The nicest part after a hot day outside was coming in to a cool place. Good AC in August = AWESOME! We would definitely stay there again! We rented both top and bottom units for our family of 12. Home was very clean and comfy, a home away from home. We were a little concerned about being so close to RR tracks, but it was really not an issue at all. Perfect location for a trip to Holiday World. It's about a five minute drive, and has the advantage of not being in the midst of the tourist traffic and bustle. We would love to stay here again. The only thing I would mention is that the downstairs unit bath is only accessible by going through a bedroom, and the extra sink is also located in that same bedroom. This wasn't a problem for us since we are all family and used to traveling together. Thanks to Kathy for a wonderful stay! Thanks for the lovely review! You are welcome to come back any time!! The second we turned the corner we recognized the house and loved it. The kids loved their room and immediatly settled in. The adults loved the outside seating and the history of the property. So glad you enjoyed your stay! I would welcome your family any time! Good location for Holiday World and Splash and Sirfari with easy 9 minute direct drive to park entrance. Nothing within walking distance but only shorticulture drive into Dale for gas, convenient store or a couple restaurants. 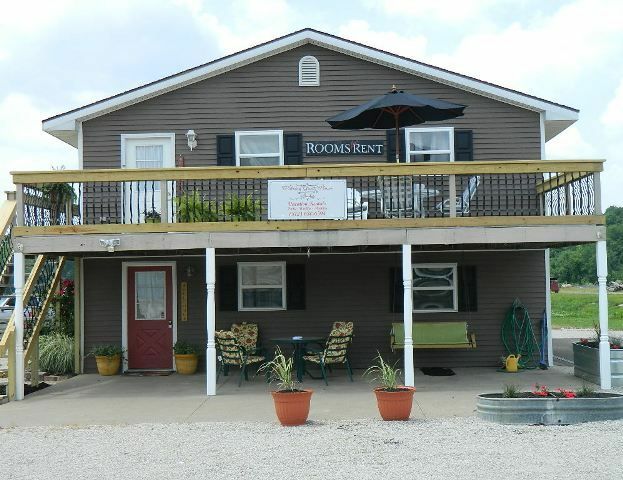 This was a very nice and affordable place to stay while spending two days at Holiday World. It was out by itself, yet only 5 to 6 minutes away. Thanks! I am so glad you enjoyed the time with your family!! RATES ON THIS LISTING ARE FOR THE ENTIRE BUILDING. Taxes not included in nightly rental. No Tax for Monthly rentals. Notes: May be exceptions to 2 night rentals if an opening between existing reservations. NO Linen rental fee. ALL Linens and towels provided.